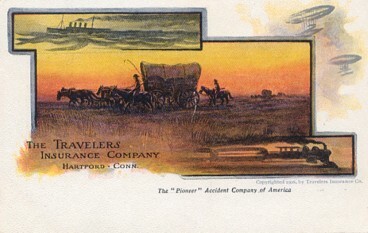 Featured is a postcard image ... a promotion for The Travelers Insurance Company from 1906. The original unused postcard is for sale in The unltd.com Store. Showcasing Insurance - Life (Term & Whole), Health & Disability, and Property & Casualty (Home, Business & Auto). Find Insurance-related Products and Services. Connect and Interact with those who share your interest in Insurance Products and the Insurance Industry. Below you'll find Merchants and Products which speak to the topic of this site and which, in keeping with our mission as The Web's Concierge, have been carefully chosen and individually screened for your shopping ease and pleasure. They are not paid ads, but rather companies with whom we have selectively chosen to partner. We do earn a referral fee if you find something you like or need and purchase it. We have striven to bring you the "best in breed" companies ... those that: we like, our friends like, have great sites and service, have good online reviews, positive consumer reports, and are family friendly. Keep us posted with regards to your own personal experiences with them. You may be surprised at companies that have not been included. The "noisiest" in the marketplace are not always the best. We have chosen 1) newer innovative companies that are performing well and garnering respect in their respective niches as well as 2) "Main Street" companies that have been reliably getting the job done for decades ... in some cases centuries. Our oldest partner, thus far, has been in business since 1819! That's staying power. Rest assured, if we've included a certain vendor in a site's line-up, there's a very specific reason for it. You may have to hunt and poke a bit, but it'll be well worth the effort. Enjoy the adventure! Kiplinger's Personal Finance: A magazine providing practical information and sound advice for maximizing your personal financial position. You'll find updates on new and existing products and services for investments, recreation, automobiles, health, and retirement. Allianz Travel Insurance: A long established provider of travel insurance and also a provider of insurance for many of the world's favorite travel and destination brands ... covers almost any travel hiccup or eventuality ... good site and overall good service ... the contracts themselves can be a bit confusing. Amazon: One of the planet's most mind-boggling arrays of goods. First came the books. Now they've added every other product on the planet. The ultimate in selection and convenience across multiple categories. Art.com: If you love Art ... any kind of art, any subject ... you're gonna love this site. It's a feast for the senses. You can browse by subject, genre, artist, room to be decorated, and even color palate. Once you've found the image you've been looking for and/or can't live without, then you have multiple product types to choose from ... there's even a great selection of wall tapestries. You'll have fun here ... no matter your special interests or current decorating mission. Their tag line says it all: "Find Your Art, Love Your Space." Target.com: This favorite shopping destination has become one of the Web's 5 top favorite places to shop ... the company has worked its way into the Fortune 50. They've really covered all the bases when it comes to customers' "wants and likes". Vital Savings by Aetna: The Dental Discount Plan that also Offers Access to Discounted Vision Care and Brand-name Prescriptions Drugs. See if it's something that works for you and your family. Welcome to unltd.com ... an unlimited network of sites encompassing all your special interests and favorite destinations. Our aim: to make your online browsing, shopping, and socializing easier, more efficient, and even more private. Explore and Enjoy!